Over the coming months we will provide for you various herbal and natural products and solutions for you to consider as alternatives to the over-the-counter products. Not only are these alternatives, simple and easy to make, but they will also save you pounds on your weekly shopping bill ! Most familiarly known for its creating “lawns” (because of its ability to form low growing “mats”, chamomile (double chamomile) is a low growing perennial (10 – 30 cm) with daisy-looking flowers. It is highly aromatic and has been traditionally used in medicinal applications across western Europe and north Africa. Chamomile flowers are soothing and calming and are used for remedies to nervous disorders and digestion. It contains antiseptic, anti-inflammatory, anti-spasmodic and anti-allergic properties. There are 3 distinct varieties, German, Roman and Treneague; the German variant being the smaller mat-forming type, but both Roman (slightly taller, growing to 30 cm) and German contain similar healing properties. Chamomile is an excellent herb for infants as well as those of a nervous disposition, usually in the form of a tea (readily available). It is also used as a mild sedative, vomiting, colic, loss of appetite, nightmares, teething troubles, itchy skin rashes in children. In adults, the tea is used aid indigestion and stomach pains of any kind, relieving tension in the whole digestive track. It can also be used (as a hot infusion) as an inhalant to relieve hay-fever and allergy symptoms. It does have a slightly acrid and bitter quality and some honey is frequently used to sweeten teas naturally. In this remedy we use the aromatic, soothing properties to apply to the skin after a warm bath. The cucumber is cooling and soothing whilst the chamomile has certain restorative qualities on dry and chapped skin. 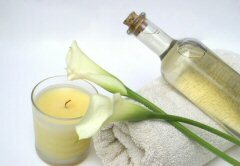 The lotion should be applied immediately after a hot bath when the skin is still warm. Chamomile and cucumber moisturising lotion. 1. Peel the cucumber to remove the green “skin” and then chop into chunks. Press the chunks through a sieve into a lass bowl to extract all of the juice. 2. Put the dried chamomile into a heat-proof jug and add approx 1 pint of boiling water. 3. Leave the chamomile to infuse for about 20 minutes then strain into another glass bowl to cool. 4. When cool, spoon in the glycerine but into the chamomile infusion but ensure that the infusion is cool and not completely cold. Mix thoroughly. 5. Pour the cucumber juice into the chamomile/glycerine mixture. 6. Pour the mix into a glass bottle with an air-tight stopper and store in the fridge. Use as required. All with many cosmetic products, the finished mixture is best kept in the fridge. Should be used within 10 days for best results. This refreshing face splash and should be used in the morning after cleansing. The mildly astringent properties of the witch hazel are balanced with the invigorating and uplifting effect of the lemon essential oil. 1. Measure the witch hazel and pour into the clean glass bottle. 2. Add the measured amount of orange flower water into the bottle with the witch hazel. 3. Then add five drops of the lemon essential oil to the mix in the bottle. 4. Safely secure the stopper (cork if possible) and hold down tightly while you shake the bottle to thoroughly mix the ingredients and store in the fridge. Storing in the fridge enhances the re-vitalising effect. Pour a little into the palm of your hand and splash on to your face after washing (or apply with a small piece of cotton wool. This is a natural way to tackle irritating athlete’s foot complaints by using the healing properties of the marigold, safflower and tea tree. The tea tree is a traditional remedy due to it’s strong anti-bacterial properties and tackles the fungal infection whilst the marigold helps to heal the damaged skin. 1. Place the marigolds into the jar and pour over the safflower oil. Ensure the marigolds are covered. Seal the jar and put in a sunny place for 3 weeks, turning occasionally. 2. Place the muslin across a sieve and pour the marigold infusion through this into a clean jug or bowl. 3. You can use fresh marigolds rather than dried; if you do, repeat steps 1 and 2 with a fresh batch of marigolds. 4. Gather up the muslin and squeeze out all of the infusion to get all the juice and oil from the muslin. 5. Add the tea tree oil to the infusion and stir in thoroughly. Transfer into a preserving/storage jar, seal and use as required. Smooth onto the affected area (cleaned and dried) twice a day. Salt-water baths are good for the skin, helping to heal minor wounds and abrasions like the refreshing and invigorating effect of bathing in a warm sea! Whether after a hard day in the garden or a strenuous sporting activity, these salts will help you to relax and recover. Ordinary salt is used in this remedy but in a rock crystal form. The food colouring is not essential to the healing effects but adds to the visual effect of the salts when dissolved in the bath water. The citrus oil mix provides a refreshing and invigorating uplift. Selection of essential oils – lemon, grapefruit, juniper, rosemary, lime. 1. Pour the salt into a large mixing bowl. 2. Carefully pour the food colouring onto a spoon and NOT into the salts directly. Just 2 or 3 drops will be sufficient. 3. Stir the colouring well into the salts; continue to stir until the colour is evenly dispersed through the salt crystals producing a pale and even colour. If blue is used the colour of the salts should be a sky blue hue rather than a deeper, navy blue. 4. Add the essential oils to the evenly coloured salt. 8 drops of juniper oil and 4 drops each of your preferred citrus oils (lemon, lime, grapefruit) and the rosemary oil if used. 5. The quantity and variety of the essential oils can be varied to suit your own personal preferences. 6. When thoroughly combined, transfer the salts into an airtight jar ensuring that the seal is a strong, tight seal if the salts are to be stored in the bathroom to prevent any moisture from entering the jar or the salt will go lumpy and damp.